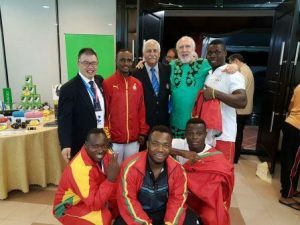 President of the Ghana Weight Lifting Federation (GWF) Ben Nunoo Mensah has received massive endorsement from the National Sports Federations to become the new leader of the country’s Olympic body, the Ghana Olympic Committee (GOC). Eighteen Federations made the proposal at a meeting last Friday, asking Nunoo Mensah to take over the mantle from the Prof. Francis Dodoo-led administration to chart a new course for the GOC. of the Ghana Volley Federation. The others were Emmanuel Tetteh of the Judo Federation, Kilian Welsh of Shooting Federation, Joseph Mingle aka Nii Adote Dzata 1 (Kick-boxing), Theo Edzie (Swimming), Rev. Emmanuel Neequaye (Netball Federation), Frederick Lartey Otu (Taekwondo), Asante Bekoe of the Ghana Rowing and Canoeing and Godwill Agyeman of the Powerlifting Federation. The source said members also concluded they would ensure that every federation played a part in the running of the GOC both at the board and the subcommittee level, should Nunoo Mensah be handed the mantle of leadership of the committee. The GOC goes to the polls in March and sports lovers in Ghana are hoping for a change to a positive direction.